Buying your first car is an exciting experience, even more so if your first car is a new car. You are the first person to sit there, it’s your choice of colour, your choice of trim… It’s your car. 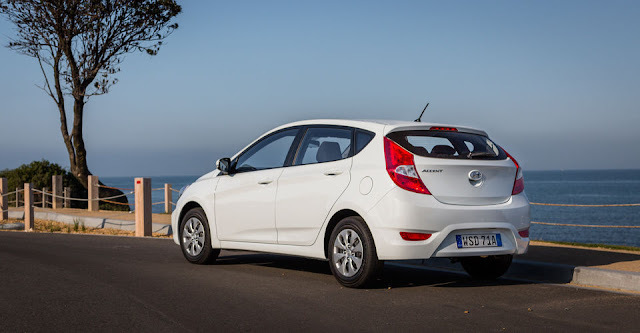 You don’t need to spend a fortune these days either, as the revamped 2016 Hyundai Accent Active proves. Ticking a lot of ‘good first car’ boxes, the entry-level Hyundai Accent Active automatic is currently priced at $15,990 driveaway. Well-priced small hatches are how Hyundai made their mark in Australia. Wind the clock back 20 years and if, like me, you spent part of the 1990s on P-plates, you would surely have known someone (if not yourself) who owned a Hyundai Excel. The cheery, curvy three-door hatch was the go-to first ‘new car’ for over 200,000 Australians between 1994 and 2000 – when it was, coincidently, replaced by the first-generation Accent. From just $15,690 (automatic, plus on-roads), the basic Excel Sprint was a near perfect first-car for the time. Bright colours, modern looks, reliable and economical – what more could you ask for? Not a lot as it happened. The Excel was pretty basic. No airbags, no aircon, no ABS and Bluetooth audio wouldn’t make its way into cars until the turn of the millennium so you had to make do with the two-speaker stereo and a glovebox full of TDK mix-tapes. Happier times? Maybe – but it shows just how far we have come, and how much ‘car’ you can get for similar money in 2015. With a list price of $16,990, the Active might be the range’s entry model, but it comes loaded with plenty of goodies to keep fresh drivers safe and happy on the road. 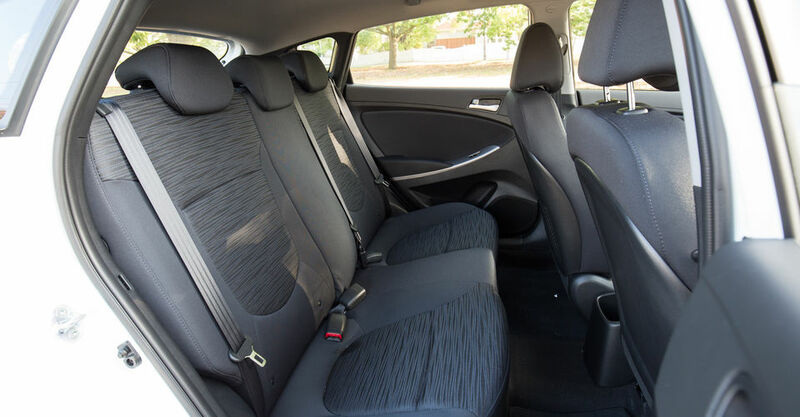 With a five-star ANCAP safety rating, six airbags, traction and stability controls, power windows, keyless entry, Bluetooth audio and phone connectivity and even a full-size spare wheel (something of a rarity these days), the ‘base’ Accent really doesn’t miss out on much. There are even seven colours (metallic and mica finishes are a $495 option) to brighten up your ride – our test car finished in standard Crystal White. Not a brand-new car, the 2016 Hyundai Accent has some some notable changes to better position it as the revised entry point into the Hyundai line-up. With the smaller i20 being phased out of the Australian market, the Accent Active has had its list price cut by $2000 from the 2015 specification car in an effort to fill the gap. To support the price drop, the Active swaps a 90kW/156Nm 1.6-litre petrol engine for a 74kW/133Nm 1.4-litre ‘Kappa’ powerplant. Mated to a continuously variable automatic transmission (CVT), the pair combine to see the Accent claim 6.2 litres per 100km. The new drivetrain isn’t a powerhouse and is actually closer in performance to the original 1990s Excel than the outgoing Accent. Off the line the car feels quite ‘zippy’, but this plateaus before you’ve finished crossing the intersection and you get the feeling that the car appreciated the 1.6-litre’s extra 16kW of power and 23Nm of torque. The engine can be quite raspy under load and we found the CVT slower to ‘relax’ in the morning too, when the car was cold. The cabin as a whole is a rather noisy place to be too, thanks to plenty of tyre noise (particularly at high speed). Our combined test loop also netted a significantly higher average fuel consumption figure of 8.6L/100km. That said, the Accent is comfortable at both highway and urban speeds, with the ride only being slightly upset by sharp surface changes, such as expansion joints on the freeway. Dashing about urban backstreets, which would likely form the majority of the Hyundai’s life, the 4.1-metre-long Accent deals as well with cobbles and speed humps as many larger cars. It errs on the ‘softer’ side of things though, so there isn’t a great deal of directness and feedback through the wheel, but at 1140kg, it is light and requires little effort to motor about town. At urban speeds, the CVT is predictable and the brakes intuitive enough to make driving smooth and relatively effortless. The interior is also particularly pleasant – especially given the car’s position in the range. The standard five-inch touchscreen media unit does not support satellite navigation, but it does handle MP3s and even ‘actual’ CDs, as well as offering a cool ‘record’ feature that allows you to dictate notes to the car and record music to the car’s media memory. Pairing a phone is quick and easy and the audio quality from the Bluetooth is also quite good. There’s a big glove box, good-sized door pockets and a handy ‘phone tray’ that conveniently includes a USB, mini-jack and 12-volt charge points as well. The cloth seats are comfortable and the driver’s has height adjustment. The steering wheel also has height adjustment and audio controls, but is sadly without any cruise control function whatsoever or phone controls. Materials are above expectation for a car in this price range, specifically the dash top which feels like it belongs in a more expensive car. Some elements do betray the ‘budget’ nature of the Accent though, most notably the air conditioning and climate switches, which feel very light and cheap. At least air-con is there though – right, Excel owners? The back seat too is comfortable and decently sized. We had four adults in the Accent for a short trip and there were no fights or claims that someone was touching someone so much that we had to turn around and not stop for ice cream. The Accent’s 370-litre boot is big enough for day-to-day use and expands to 600L when the back seats are dropped forward. The seats don’t fold completely flat though, so you might need to borrow Mum’s wagon for any IKEA trips. While at the back of the car, it’s important to call out two notable omissions from the little South Korean: No parking sensors and, most critically, no reversing camera. Alright, you can live without parking sensors, but in this day and age, when a reversing camera is standard equipment on a Toyota Yaris, Honda Jazz and Volkswagen Polo, the latter is a borderline must – even on a car at this price point. The 2016 Hyundai Accent is another great little first car from a company that made its name in Australia by selling great little first cars. With a five-year unlimited kilometre warranty and a lifetime capped-price service plan minimising any potential ownership dramas, the Accent Active is a safe, simple, comfortable and value-packed option well worth considering. It’s not quite as new as the Mazda 2, as practical as a Honda Jazz, as ‘nice’ as a Volkswagen Polo nor as fun to drive as a Suzuki Swift, but it is good value. And if Hyundai can move even half of its i20 sales into the Accent camp, the brand could (again) claim the prize for best-selling light car in Australia.